Band Sawmill or Chainsaw Sawmill? Chainsaw sawmills and band sawmills both have their place. 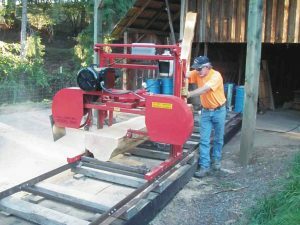 It’s easy to be tempted to buy a chainsaw sawmill because they typically cost a lot less than band sawmills. But it’s important to really understand the benefits, and limitations, of chainsaw sawmills. Much smaller kerf which means more lumber and less sawdust. Much larger kerf which means less lumber and more sawdust. In the end, if you plan to mill any volume of logs at all, the most efficient, easiest-to-use platform is a portable band sawmill. If you need to get a mill into a very remote place by small boat or plane, then a chainsaw sawmill may be your best solution. Another thing to remember is that if you have a very remote milling site, but you still want to use a band sawmill, some sawmill manufacturers offer their mills in kit form. This makes it easy to move the sawmill into remote places before assembly.